I’m actually leaving it up to Laura to write about our driving adventures to see the Yarn Harlot on Saturday, but I’ll give you the quickie-version. I live approximately 30 miles south of Los Angeles and for those of you who’ve been to California before, I only live about 8 miles north of Disneyland. I now understand why I live closer to the latter … it’s easier to get there! Not only did we run into some unexpected traffic (although with Los Angeles, why was I thinking there *wouldn’t* be traffic? ), but we also thought we had missed our exit, and tried to create our own route which led to its own adventures through Chinatown and such. Luckily, the Yarn Gods must have been smiling on us, because we eventually ended up in a parking garage that we thought might be *close* to our destination and as we exited the garage, you’ll never believe what was directly across the street from us … the Los Angeles Central Public Library. The exact location we were looking for. Now, I won’t bore you with the details of trying to go home, but let me just say… never a dull moment. As anyone who has ever written a blog post has stated, attending a Yarn Harlot event is definitely worth the drive, the time, the babysitting expense, whatever. Yes, her books are funny, but listening to her speak made me think I was at the Improv watching a stand-up comedy routine. People around me had tears streaming down there face because they were laughing so hard! The only thing missing were the hot looking waiters serving drinks! I met a lot of wonderful knitters and it was also real treat to finally get to meet Jillian who not only frequently leaves me some very nice comments here at my little ol’ blog, but has been a huge help and support in helping me cope and understand fibromyalgia. And where is the photo of me with the Harlot? Hmmmm…. I was so damn excited just to meet her and have her sign my books, that I completely forgot. I’d blame it on blond roots, except at my age, they are gray now. And the most pathetic thing? The camera was hanging from my wrist! I got photos of Laura with her, but none of me. 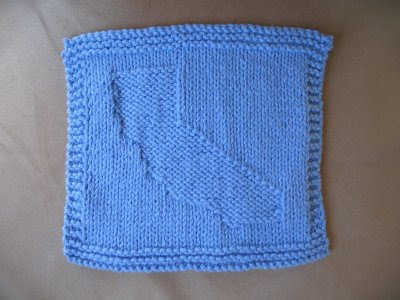 I did however, remember to take a photo of my California State dishcloth that I made for her, and she photographed me with it, which you can see on her blog post. 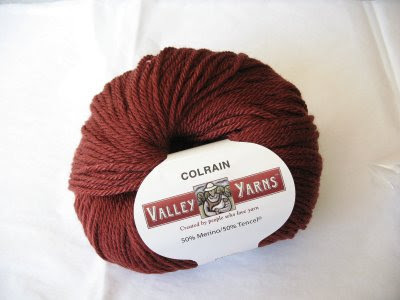 So what’s it like to be on the Yarn Harlot’s blog? Absolutely Surreal!! I rock, but you rock more! I just saw the most surprising and amazing thing! Lara at Yarn It nominated me for a Rockin’ Girl Blogger award. I’m completely in awe that she did this for me (since my blog only seems to “rock” once in awhile), but I’ll accept the honor anyway. I know I’m supposed to nominate others for this award as well, but honestly, I just can’t narrow down the list of awesome bloggers that I frequently read. I also know that quite a few of you have already received this amazing award. I know it’s been almost a month since my birthday came and kicked me in the arse, and I’m yet to share with you some of my birthday treasures and since they are knitting-type related, I thought you might be interested. First, my sister in Pittsburgh has only ever acknowledged my birthday with a card, but this year, I received a gift certificate to The Loopy Ewe. 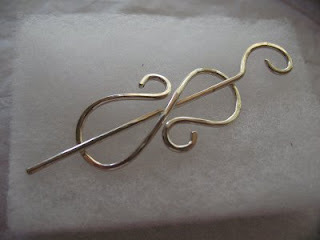 I chose to spend my money on something I would have forever, so I selected the sterling silver Eternity shawl pin from Designs by Romi. Although I only have my Clapotis shawl to use it with, since I’m still working on the Mystery Stole, hopefully this pin will work well with it. Second, my baby sister at Bits and Pieces gave me a gift certificate to Amazon.com, so I picked up a couple of books from my wish list. Favorite Socks from Interweave Knits has been on my list since before it even released. I’ve already knit the Embossed Leaves Socks before and loved them, so next up I think is the Waving Lace Socks by Evelyn A. Clark. And, since my sister is a crocheter that I taught to knit, I chose the Teach Yourself Visually Crocheting book so she can claim she taught a knitter to crochet. It counts. 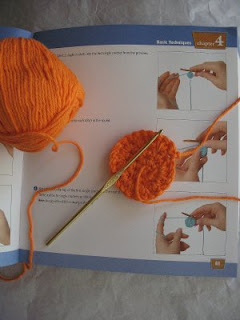 I’ve already started with a few practice swatches in this orange cotton yarn and the book has great step-by-step photo guides for everything. There are 14 chapters of over 273 pages of information regarding everything you ever wanted to know about crochet, so I’m giving this book a huge thumbs up! In other news, I’ve been meeting with contractors and handymen the last few weeks for some desperately needed work on my home. Hopefully most of the work will be completed by the end of the month and hopefully I may even have some money left over for food when it’s complete! I’m off to Salem, OR for a few days, so I’ll try to catch up with emails & blog reading and all of that when I get back, since I’ve decided to make it a computer-free getaway. Until then, I leave you with photo evidence of what happens at a family party when my dear husband feels it necessary to harass our son-in-law. I originally saw the No Sheep For You book at Stitches West and instantly knew I should add it to my very small knitting book collection. 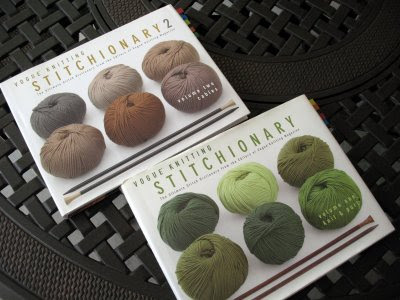 Although I’m not one of the very unfortunate people that is allergic to wool, I do appreciate the non-wool fiber options that are currently available, and I also appreciate the great designs this book has to offer. Marrying non-wool fibers and great designs into this book was a brilliant idea. The first 3 chapters (about 25 pages) is an introduction covering information about the non-wool knitting fibers currently available, the differences between them, and understanding them for yourself. This section had so much great information in it, and it really helped me understand where fibers come from and how they may or may not work in my next knitting project. The meat of the book is obviously the patterns and there are twenty of them ranging from simple to complex. There is a great variety in patterns and surprisingly there were even a few for men. As everyone I’m sure knows, the author is Amy R. Singer and she has contributed a beautiful shawl pattern, but I was surprised to see such other amazing contributing designers such as Barbara Gregory, Sivia Harding, Amy Swenson and Jenna Wilson, just to name a few. I can’t say I like all the patterns in this book, because I don’t, but a few of them really stood out and if I were to choose a few that I would definitely knit, these are probably my favorites. I was surprised that the book inspired me to take the patterns I didn’t particularly care for though, and think of ways to change them to suit my needs. I definitely can’t afford to knit a bathrobe out of silk, but maybe I can find an different fiber that would produce just as beautiful an object at an affordable price. There’s also a cardigan that has wonderful lines, but I didn’t like the decorative design feature of the fleur-de-lis, so obviously if I knit it, I’ll omit that particular design. I also love the Bacardi cardigan, but I could never pull off that color palette, so won’t it be fun trying to find colors that suit me but that also blend together? There was even a cardigan for a man that my husband might even wear, but only after I change the neckline. 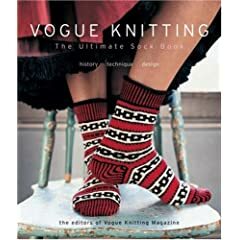 I think this book is perfect for those of you who are allergic to wool and I urge you to add this to your knitting library. And as for the rest of us, who couldn’t use a knitting book that opens our eyes to the world of non-wool fibers and provides some beautiful patterns as well? Won’t it be fun for us to knit these non-wool patterns into wool fibers? Final note: I know I promised this review awhile ago, but my original post didn’t get saved and rewriting this just never seemed a priority. I’ve never written a book review or anything like this before, so please don’t be too harsh. This was extremely difficult for me to do and so I’ve definitely stepped out of my comfort zone. I’m currently knitting Cookie’s Baudelaire sock pattern with the Socks that Rock lightweight yarn in Jasper colorway. Of course since it’s a red/purple tone, it’s very difficult to capture the correct colors in the photo, but I think you get the idea. I’m loving knitting these since the pattern is written toe-up, so I don’t have to do any pattern converting. YEAH! Laura and I went to our LYS on Monday so I could enhance my stash. One of my sisters is have her third little girl and has requested a white cardigan sweater. Personally I think a white baby cardigan is boring, but it’s what she wants. 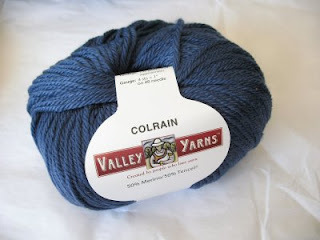 I tried to find Debbie Bliss Baby Cashmerino and RYC Cashsoft in white, but since there was sadly none of that or any really “nice” yarns in white, I got stuck purchasing the Sidar Snuggly DK yarn. Little does she realize (she’s not a knitter) that had she let me choose the color, she would’ve ended up with a better overall sweater, but since she doesn’t know, I’m probably the only one sad about it. The pattern is the Matinee Coat from the Debbie Bliss Simply Baby book and although I’m knitting it in the smallest size, I doubt it will fit the baby until the fall since Debbie Bliss patterns are rumored to run a little bit big. I also enhanced my stash at the LYS by purchasing another pair of Addi Turbo Lace needles in a 24″ size 3US. I noticed that quite of few of the lace patterns in Victorian Lace Today used that needle size, so I figure it may come in handy. I also found this navy blue laceweight yarn called Grignasco Regina which is listed as “merino fine” pure new wool. From what I can tell, this yarn is similar to Skacel Merino Lace since both are 100 grams and 2/25; the Grignasco is marked as 1363 yards and the Skacel is 1375 yards. Pretty close huh? I’m either going to make a lace shawl for my mother in law or my grandmother, but I haven’t decided on a pattern yet, so it will sit until I feel inspired. Since every Friday in blog-land (or blog-ville if you prefer), I see AMAZING photographs for Eye Candy Friday, I decided that since I don’t take amazing photographs (yet), that I’d start “NOT Eye Candy Friday” for myself. This may be a weekly thing, or it may be a one-time fluke for today, who knows. I’ve now discovered that I live under a rock and that Amber is my neighbor. She posted about the jogless bind-off in the round and it is brilliant! I’ve never seen it before (because I must live under a rock) or if I had, I must have disregarded it. This is exactly the type of bind off that is perfect for toe-up socks and I can’t wait to try it on my current pair. This pair of socks has been tossed aside and ignored for about a week though. I’ve either been burned out on sock knitting (perish the thought) or got so tired of ripping out the heel that I couldn’t stand to look at them any longer. Now I have renewed energy to complete them so I can try that bind-off. Thanks Amber! Now these socks may be finished in time for my March knitalongs. Just in case you’re wondering, this is the Zephyr Socks pattern knit in Regia Bamboo yarn. 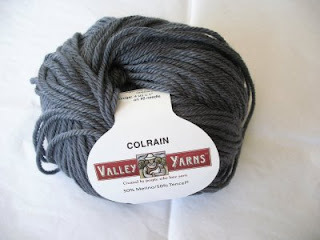 The winner of my blogiversary contest, Abby, got to meet the Yarn Harlot on Thursday. I’m really happy for her, but I’m sooooo jealous. I found out the Harlot is going to be stopping in Northern California for her book tour, but not southern California. She didn’t come here for her last book tour either. Maybe I should move. I have the BEST husband. The other day I was looking at my Amazon wish list when DH walked up to me and asked what I was doing. After stating that I was just adding books to my wish list, he asked me which ones I want. Why all of them, of course. I showed him my top five and next thing I know there was some button clicking going on and all the sudden there was a page about my order being sucessfully placed. WOW! And here’s what he bought me! Most of you already own Socks, Socks, Socks so I won’t go into any details about it other than to say I was pleasantly surprised that there were so many sock patterns that I really loved and could actually see myself knitting about half the patterns in there. The No Sheep for You book really deserves its own review. I normally don’t review books, but of the blogs I read I haven’t seen anyone review it, so I thought.. why not me? So as to not “bore” you with it today, I’ll save the review for another day. This weekend involves a library book sale, visiting a new knitting store,watching the grandsons at itty bitty t-ball, spending some much-needed time with DH, and of course knitting! I should have some fun things to blog about next week. Have a great weekend!